BULLETIN: Happy Easter to those who celebrate this day. Happy Sunday to those who do not. I heard from Sandy Asher yesterday with not one but two nice pieces of news. First, Sandy’s wonderful picture book, CHICKEN STORY TIME, has been nominated for the Kansas Reading Association’s 2018 Bill Martin Jr. Picture Book Award! Way to go Sandy! If you haven’t picked up a copy of her book, you need to pronto. The second piece of good news is that SOMEBODY CATCH MY HOMEWORK, the play that Sandy wrote based on poems from my collected works (at the time), is about to be performed again, this time at The Episcopal Academy in Newtown Square, PA on May 19. I’ve seen it performed more than once and love it each time. It opened with its world premier here in Springfield at the Vandevort Theatre in 2004. I don’t know how many times it has been performed. Maybe Sandy will remember. I believe it was also performed in Europe on one occasion. If I’m wrong about that, it makes a good story. This will be a good day. I know what I’ll work on and expect to make progress. 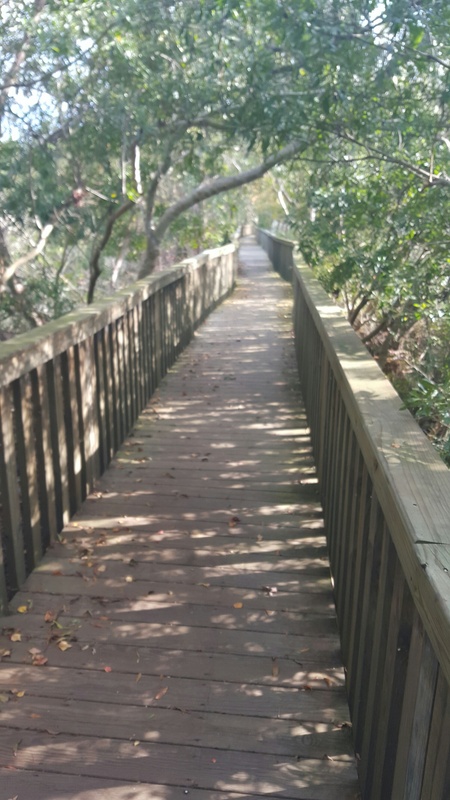 Some of my energy comes from the walk we took in the Sea Pines Forest Preserve at Hilton Head before leaving. The woods and walkways there would inspire anyone’s muse. 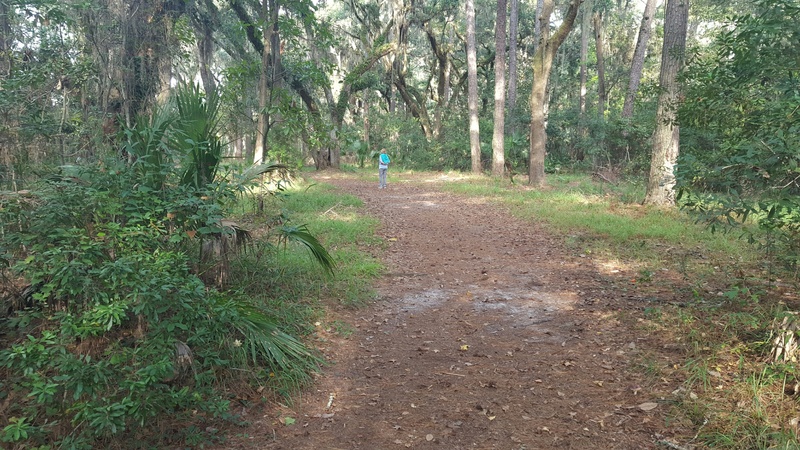 According to the literature, it’s 605 acres of forest, marshes, lakes, and meadows. Along this boardwalk we heard but couldn’t spot a red shouldered hawk singing from a tree out in the marsh. Saw no alligators but could feel their presence. An ancient cousin sprawled on a log like an off duty lifeguard. 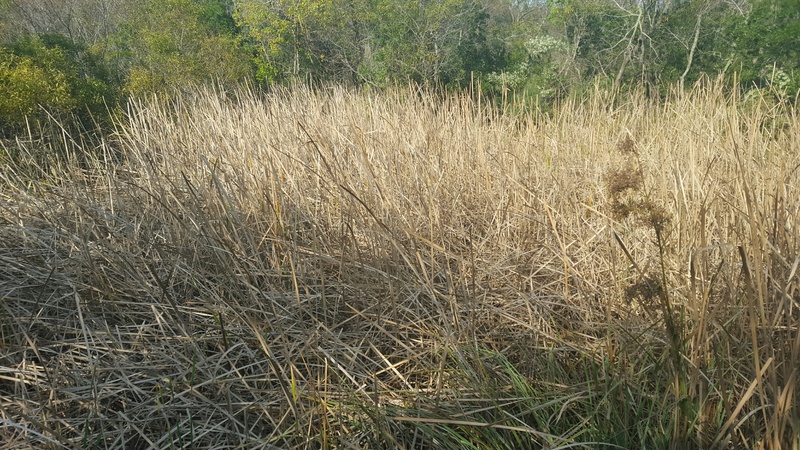 Saw but didn’t hear a red winged blackbird darting from perch to perch in this thick stand of saw grass. 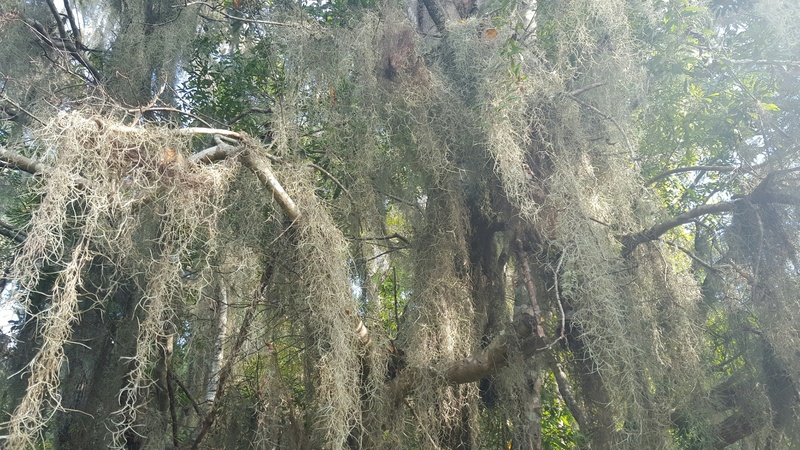 Above us the trees wore Spanish moss like gray chin whiskers. 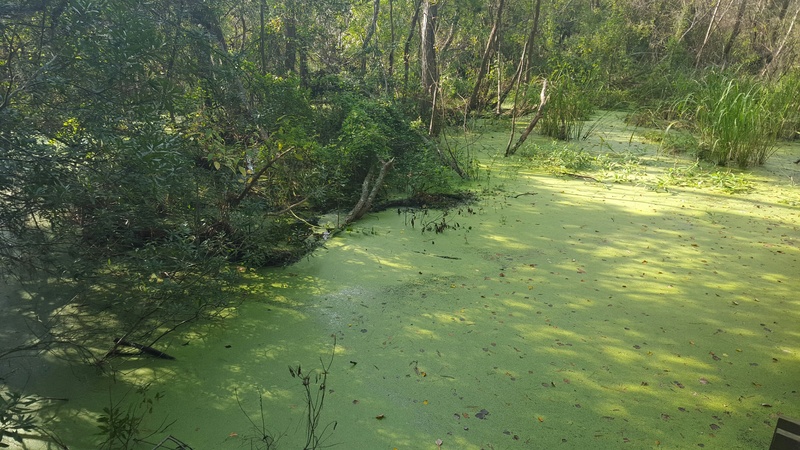 The water below us hid its mysteries beneath a green blanket of algae. 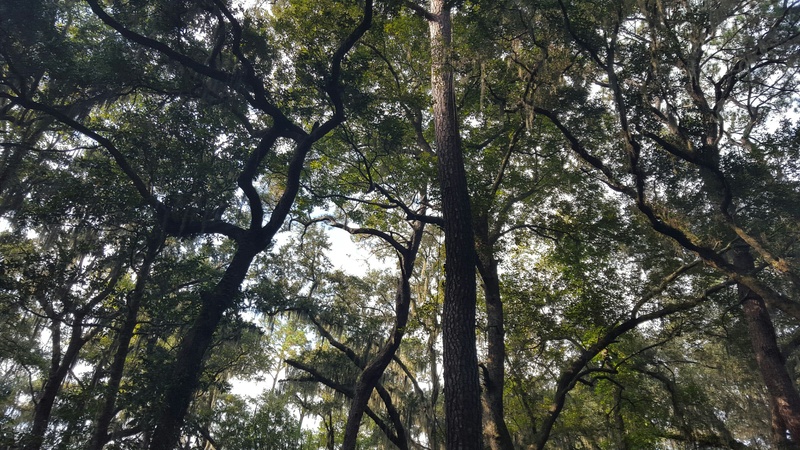 Felt a profound sense of peace among those gigantic oaks. Heard but didn’t see a pileated woodpecker crying out like a ghost among those vaulted ceilings. Who wouldn’t be moved to write after strolling in such a place! Upcoming chance to learn about Phoresy and the Mycorrhizals ! 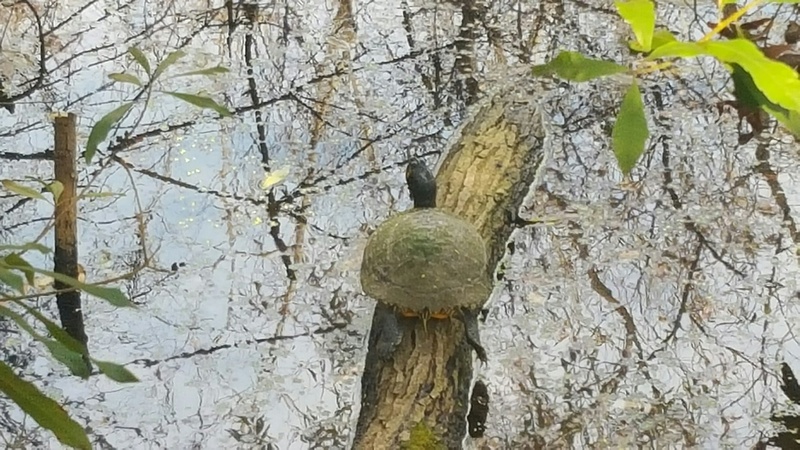 Bob, a retired gastroenterologist, and his wife, Barb Kipfer, a retired nurse, are Master Naturalists and maintain a highly informative and entertaining blog: http://springfieldmn.blogspot.com . They have been honored many times, this year by the Forestry Service for their work in responsible tree management. Their list of accomplishments is long and varied. Bob was my doctor but Sandy and I became friends with the Kipfers on a trip up the Amazon in 1999. My poetry collection, SOUNDS OF RAIN, came from that excursion. Recently Sandy and I spent a fascinating afternoon touring the Kipfers’ 400+ acres of woodlands and streams in an ATV. I asked Bob and Barb if they might have an interest in working together on a book. I’m pleased that they agreed. Now all we need is the book, but that’s a story yet to be written.